A landlord has an unfettered legal right to terminate a tenancy upon giving adequate notice. This is because the property is his and he can at any time retrieve it subject to the conditions of the tenancy agreement. Once he abides by the provisions of the tenancy agreement, the tenant has no choice than to vacate possession. If the tenant refuses to quit, a court of law can, on an action by the landlord, force him out of the premises. Many Landlords and Tenants have been mixed up in endless court battles and rigorous negotiations and/or arguments over notices to quit. The arguments of many tenants have been that the notices are invalid or not properly served while Landlords believe otherwise. This is a quick attempt to clear the air on the issue. In order to recover possession of his premises, a landlord must determine the tenancy, by service on the tenant of the appropriate notice to quit depending on the type of tenancy. a) In the case of a tenancy at will or a weekly tenancy, a week’s notice. c) In the case of a yearly tenancy, half a year’s notice. On the determination of the tenancy, the tenant should be served with the statutory 7 days’ notice of the landlord’s intention to recover possession of the premises. Thereafter, the action can be filed in court. It should be noted that service of valid quit notices is a precondition for the recovery of possession by the Landlord. It is settledthat a notice to quit in order to be effective ought to determine the tenancy at the end of the current term of the tenancy as illustrated in the case of African Petroleum Ltd. V. Owodunni (1991) 8 NWLR (Pt 210) 391. For instance, a notice of six months is necessary to determine a yearly tenancy and such notice must terminate the tenancy at the end of the current term of the tenancy. Thus any notice given to end at the middle of the term of the tenancy will be invalid. This was illustrated in Akpokiniovo V. Air Liquide Nigeria Plc (2012) LPELR – 9582(CA). Where a tenant for a fixed term refuses at the expiration of his tenancy to vacate possession and wrongfully, that is, without the consent of the landlord, continues in possession, he would be a tenant at sufferance. This arises where a tenant at sufferance, holds over without the landlord’s assent or dissent. 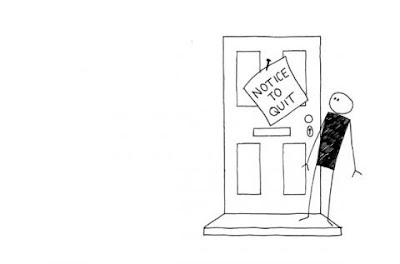 What is important to note is that, if a notice to quit does not follow the stipulated time prescribed by law, it is not valid.